50 Bulbs Battery operated Indoor&Outdoor String lights, can be used anywhere like in indoor and outdoor,the most ideal for party and wedding decorations. Using this fairy lights to decorate your Christmas tree, living room, bedroom, stairs, corridors, gardens, etc. Perfect for different occasions such as wedding, Party,Christmas, Halloween, New Year, Valentine's day, etc. Timers:---- The "Timer" Button, product will be automatically on for 6 hours per day. IF YOU HAVE ANY PROBLEM, PLEASE FEEL FREE CONTACT WITH OUR SERVICE TEAM. 【 Battery Powered String Lights】Powered by 3AA batteries(not included). There is no hassle to looking for socket/outlet everywhere. you could move it anywhere as you need. 【8 Working Modes】 String lights controller have 8 working modes - Combination, In Waves, Sequential, Slo-Glo, Chasing/Flash, Slow Fade, Twinkle/Flash, Steady on.Various modes for selections create vibrant, dynamic, joyful ambiance for your family and friend. 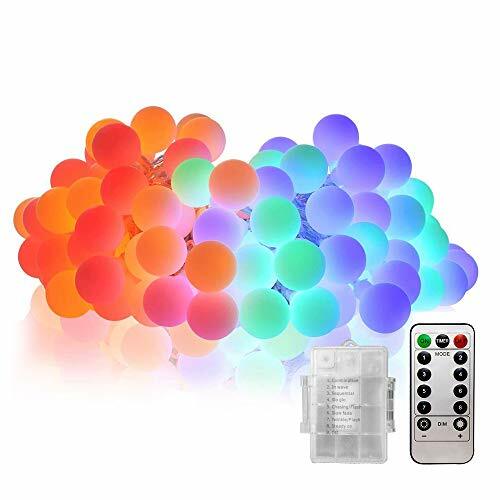 【RGB LIGHTING BALL STRING LIGHT】50 LED 17FT with wireless remote control,diameter of each globe is 0.7 inch, Soft string,you can bend it around signs,plants,furniture and almost everything else. If you have any questions about this product by Labvon, contact us by completing and submitting the form below. If you are looking for a specif part number, please include it with your message.